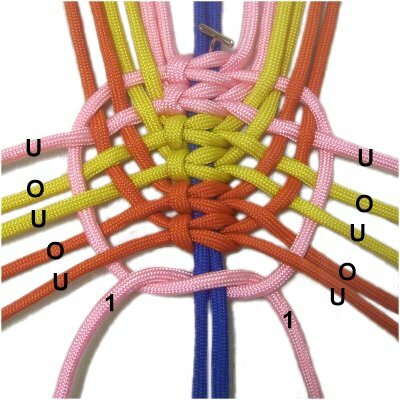 Description: The Square Knot Weave was found in a Macrame book written in 1903, so it's a vintage technique. It is a variation of the Fish Bone Designs, but the working cords weave through one another. 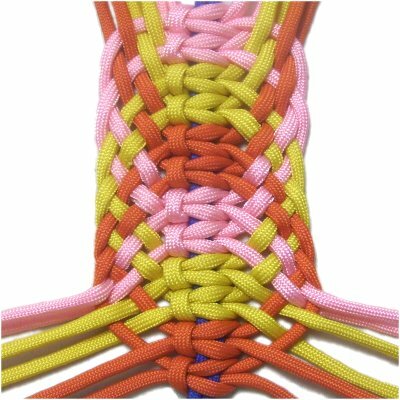 This decorative knot can be used for Hammocks, in the same way a Clew Knot is positioned between the ring and the dowel. It makes a nice belt if made with finer materials, or fewer cords. Important: Make sure you know how to tie a Square Knot before you get started. 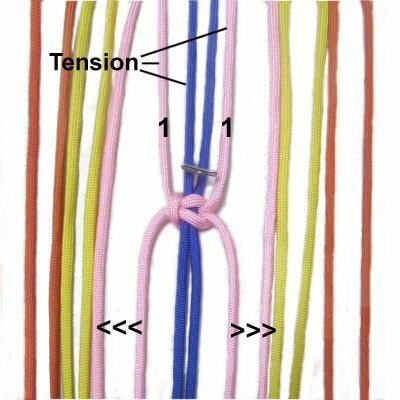 Step 1: To practice the Square Knot Weave, you need one filler cord, folded in half and placed in the center of your board (dark blue cord shown). Place three 2-yard working cords on both sides of the fillers. Mentally number the cords as shown, starting at the center and moving outward. 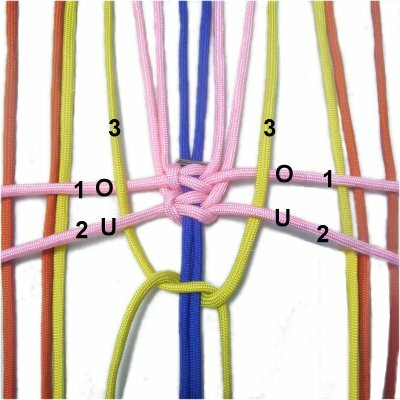 Designer's Tips: When using this knotting technique in a Macrame project, make sure you always have the same number of cords on each side of the fillers. This design looks better if the colors are the same on both sides, arranged in opposite directions, as shown in the images. To use this technique in a Hammock design, you would attach the cords to a ring, rather than directly to a project board. Step 2: Use working cord 1 from both sides to tie one Square Knot onto the fillers. Move the working cords to the right and left, then secure them. Step 2, continued: Make sure the cords have tension in the area above the first knot, and when you secure them. 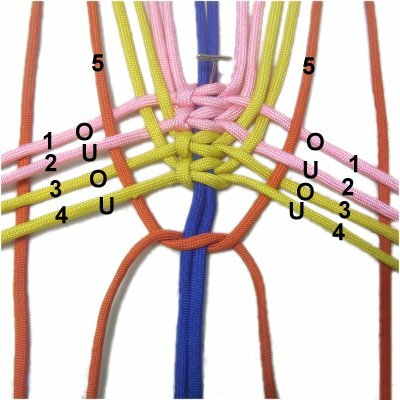 This applies to all the remaining steps for the Square Knot Weave. Placing a pin above the first knot will prevent the SK from sliding upward. Step 3: Pass working cord 2 (both sides) under working cord 1. 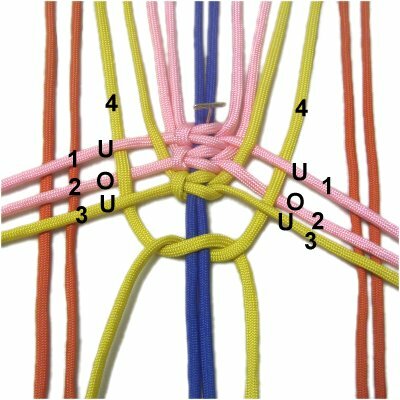 Use them to tie the second Square Knot, tightening it so it rests against the first knot. Secure the two cords after moving them off to the sides. Step 4: Select working cord 3 on both sides, then weave them over cord 1 and under cord 2. 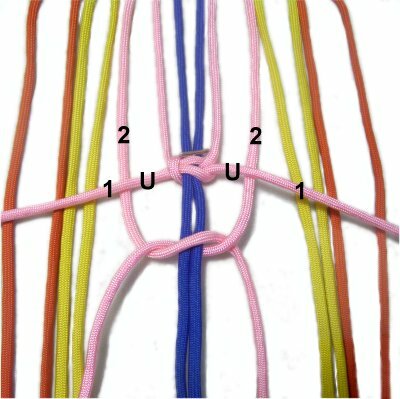 Use the two cords to tie the 3rd SK onto the fillers, resting against the 2nd knot. Secure cord 3 as you did the others. Step 5: Select working cord 4 from both sides, and weave them under - over - under cords 1 - 3. Tie the Square Knot, then secure the two cords. Designer's Tip: From this point onward, it's important that the cords have lots of tension in all areas. 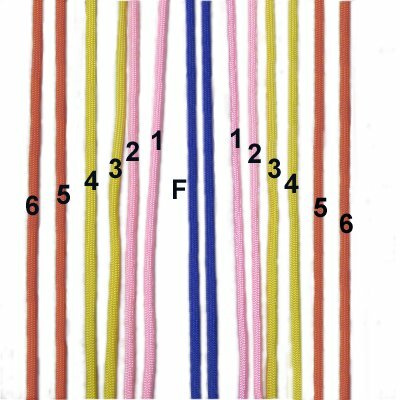 So pull on cords 1 - 4 and re-secure each one diagonally. Step 6: Weave cord 5 over - under - over - under cords 1 - 4. Tie the Square Knot and secure the cords. 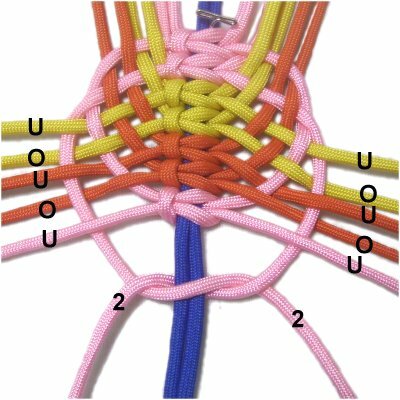 Step 7: On both sides, weave cord 6 through the other five cords under - over - under - over - under. Tie the SK, then secure cord 6 off to the sides with the others. 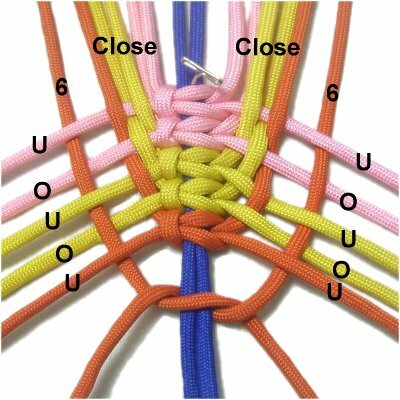 To neaten the top area of the Square Knot Weave, move the cords close to each other. Step 8: Select cord 1 on both sides, and weave them under - over - under - over - under the other cords. Tie the SK onto the fillers. Step 9: Repeat step 8, using working cord 2 on both sides. The over - under sequence is the same. Step 10: Repeat step 8, using working cord 3. Repeat again using working cord 4. Push the cords close together in the woven areas. 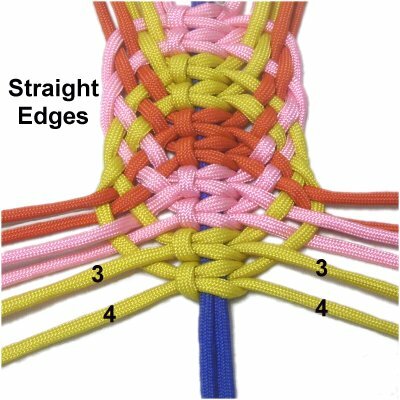 The right and left edges of the Square Knot Weave design should be straight. Step 11: Repeat step 8, using working cord 5. Then do the same with working cord 6. Designer's Tip: When using this design as part of a Hammock, the ends would be pulled taut when the weaving is finished, and secured to the dowel with Double Half Hitches. 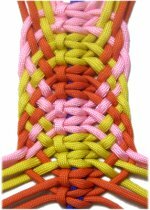 Have any comments about the Square Knot Weave? Contact Me.